Mumbai, February 12, 2018 – Clariant, a world leader in specialty chemicals, showcased its extensive portfolio of products and services for the plastics industry under the theme – ‘Expand your Horizon, Boost your Performance’ at Plastindia 2018 in Ahmedabad, Gujarat from February 07-12, 2018. Clariant continuously invests in new technological platforms, offering the plastics industry innovations that address current market trends, particularly for high performance products that are aligned with sustainability concepts. 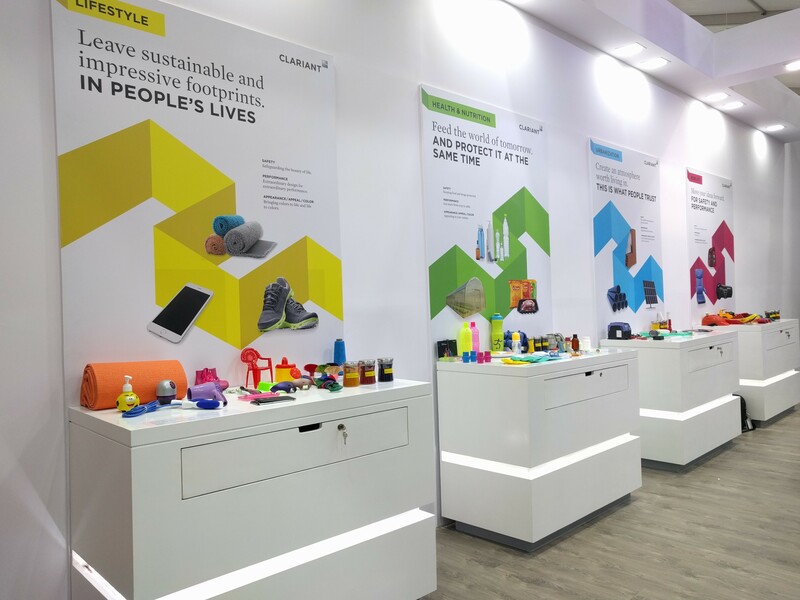 At Plastindia 2018, Clariant highlighted how its specialty chemical products and solutions provide appealing functionality, in addition to sustaining product safety and environmental compatibility for customers in the global megatrends areas of lifestyle, health & nutrition, urbanization and mobility in India. Color Masterbatches Range – REMAFIN®: Remafin masterbatches for polyolefin polymers, RENOL®: Renol masterbatches for high-performance engineering thermoplastics, OMNICOLOR®: Omnicolor multipurpose color concentrates, MEVOPUR®: Mevopur medical-grade masterbatches for the medical industry, delivering hundreds of standard colors as well as custom formulations and color/additive combibatches. Additive Masterbatches – CESA® additive masterbatches from Clariant offer remarkable opportunities to improve the performance of plastic products. Safer coloration of plastics – Clariant will feature major advances in pigments and dyes promoting greater safety in the production process and for end-product users. PV Fast® Pigments Range: High performance organic pigments with excellent heat resistance, high light fastness and very good bleeding fastness properties. These pigments are designed for their ease of dispersion in thermoplastic materials and are specifically suitable for fiber, thin wall and difficult technical applications. PV Fast Pink E, PV Fast Red E5B, and PV Fast Orange H2GL were in focus. PolyBond Range: The PolyBond pigment preparations for the coloration of EVA footwear and EVA molded articles. These dust free pigment preparation offer added advantage of high quantity for molding machines. AddWorks® PKG: Clariant’s solutions for flexible packaging film helps polyolefin film manufacturers in their film process to achieve an excellent cost/performance balance. It allows the resin to withstand the high line speed and maintain the film quality with reduced breakages and significant gel and black spot reduction. Exolit® OP: The Exolit OP series offers environmentally optimised non-halogenated, organo-phosphorus flame retardants for engineering thermoplastics and thermosets. Exolit OP 1400 provides enhanced thermal stability for polyamides, enabling complex injection molded parts to be manufactured at high processing temperatures. It is suitable for hot and humid environments and has been awarded the Clariant EcoTain® label for outstanding sustainability and best-in-class performance. EcoTain labeled products have undergone a systematic, in-depth screening process using 36 criteria in all three sustainability dimensions: social, environmental and economic. Licocene® and Licomont®: High-performing Licocene, Clariant’s low molecular polyolefins, act as very effective dispersing agents for high quality color and additive masterbatches to meet increasing requirements from the plastics sector. The Montan wax specialties, Licomont CaV 102 and Licomont NaV 101, reduce cycle times significantly, provide high thermal stability and offer better processing conditions for selected engineering thermoplastics that are processed at higher temperatures. Clariant in India, headquartered in Mumbai, operates in four business areas: Care Chemicals, Catalysis & Energy, Natural Resources, and Plastics & Coatings, including businesses like Pigments (Coatings, Printing and Plastics and Special Applications), Additives, Industrial & Consumer Specialties, Mining Services and Masterbatches, thus delivering solutions for the industry and the society. The 900-plus employee strength generated sales of INR 10.08 billion (in 2014). In 2014, Clariant invested in a state-of-the-art Regional Innovation Center in Mumbai, with an aim to co-create tailormade solutions with customers for the industry. Clariant is committed to Responsible Care® and several external sustainability initiatives such as the Global Product Strategy and the United Nations Global Compact. Clariant is one of the top European chemical companies being part of Dow Jones Sustainability Indices. Clariant showcases products under the megatrends of lifestyle, health & nutrition, urbanization and mobility.